Founded in 2006 and listed on Euronext in 2013, Orège is a clean-tech company that has developed an innovative, patented technology (solid, liquid, gas – SLG) to significantly reduce sludge treatment costs and improve environmental sustainability of the treatment process. Its core markets include North America, the UK, Germany and France. Note: *Net income is normalised, excluding amortisation of acquired intangibles, exceptional items and share-based payments. **FY17 results have been restated by the company and will be updated once the full accounts are made available. Orège’s FY18 results showed a significant revenue pick-up (six times restated 2017 revenues). EBITDA and net income were marginally ahead of our forecasts as lower revenues were more than compensated by lower operating expenses. We believe the ytd ramp-up in orders puts Orège on track to reach our FY19 forecast of €6.3m revenues (2.8x FY18 revenues). The recent share price decline means the risks to valuation are significantly skewed to the upside, in our view. Revenues of €2.26m, an almost sixfold increase on restated 2017 revenues of €0.39m. Revenues were 13% below our forecast of €2.59m. The EBITDA loss was €7.7m, >20% smaller than 2017 and 2% better than our forecast of €7.9m. This was driven by lower operating expenses than we previously expected, more than offsetting the lower revenues. Net loss was €10.9m, 20% smaller than 2017 and 3% better than our expectations. Net debt of €44.4m was broadly in line with our forecast (€44.0m). We continue to believe that a significant ramp-up in orders is one of the key catalysts for the re-rating of the stock. Orège made progress over the last few months as it stated that at the date of the FY18 results announcement (10 April), the overall value of the order book was €2.5m (vs €2.3m revenues in FY18) and several further contracts are expected to be signed in H119. Assuming this trend of commercial development continues, we believe Orège is well placed to achieve our maintained FY19 revenue forecast of €6.3m, which implies 178% y-o-y growth. The order book was boosted by a contract in January 2019 for a six-year lease agreement for three SLG solutions with the City of Orlando, US, for over $1.3m (we estimate a revenue contribution of around $1m for FY19). 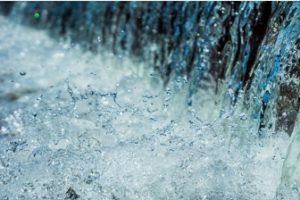 Orège operates in the global wastewater equipment market ($9.5bn per year market size with 5–6% annual growth, according to Global Water Intelligence). It has developed a proprietary and patented technology (solid, liquid, gas – SLG) that reduces sludge treatment costs for utilities by up to 80%, with a strong investment case for its clients (payback periods of less than three years). In addition to large economic savings, SLG brings important environmental sustainability advantages to the sludge treatment process (lower energy use and lower volumes transported, improved sludge quality, etc). Over the last few years, Orège has developed several successful references for various applications and geographies and is now ready to achieve its full commercial potential, particularly in the UK and North America. Client feedback on the technology strongly supports its effectiveness. We derived our forecasts for Orège’s top line by applying a range of penetration rate assumptions to the estimated size of the core market opportunities for the flagship product SLG in the key countries for Orège: the UK, North America, Germany and France. Our estimates are based on a forecast of a €439m annual addressable market size for SLG technology (current applications only) in North America, the UK, Germany and France (we provided detailed calculations in our initiation note, Innovation in environmental sustainability, published on 17 October 2018). These estimates do not include significant growth opportunities in Asia (especially following the signing of a partnership for distribution and integration of SLG solutions in Japan with ITCMT, a subsidiary of the Japanese ITOCHU Corporation) and in Southern Europe, which we understand Orège is also targeting. We forecast revenues increasing from €6.3m in FY19 to our estimated base case revenue potential of €57m in FY23 (in our initiation note, we identified a bear-bull range of €22–93m revenues). We expect high operational leverage to drive a strong margin improvement, leading to positive EBITDA in FY21 and cash flow in FY22. We continue to expect a significant revenue ramp-up and have made only small changes to our FY19/20 forecasts, with revenues broadly unchanged and marginally smaller EBITDA and net income losses, reflecting lower operating expenses. Source: Orège data, Edison Investment Research. Note: FY18 new = actual. Importantly, as Orège’s net equity fell below half of its called-up share capital in 2017, there is a requirement for it to proceed with a capital increase by the end of FY19. We believe clarity on the financial structure is the other important catalyst for the stock. Until then, investors have visibility on the short-term sustainability of the activities, as majority shareholder Eren (69% stake) has provided a €7m credit line to cover the financing needs in FY19. Due to the risks resulting from the early stage of commercial deployment, we believe investors should assess a large range of potential growth outcomes and valuations. As explained in our initiation note, we used a valuation methodology similar to the one we use for early stages biotech companies: we estimated the addressable market size, assumed penetration rates and used a DCF methodology to take into account the future prospects of the group. We have used a 12.5% WACC, consistent with the rate we use for companies at a similar stage of development. The terminal value is based on median EV/Sales, EV/EBITDA, EV/EBIT values of more mature water/wastewater equipment companies (Exhibit 4). Source: Refinitiv. Note: Prices as at 10 April 2019. Our valuation approach returns a base case valuation of €3.84/share (broadly unchanged vs €3.86/share previously). The base case valuation reflects a sustained growth in revenues (+74% FY19–23 CAGR), mostly in the UK and North America. If Orège can establish its technology as industry standard and its products become widely adopted, we believe there is significant upside to the current share price (our valuation would be €9.31/share vs €9.36/share previously). On the contrary, the bear case of €1.64 (unchanged) reflects the impact of potential delays in ramping up the commercial development of the company. 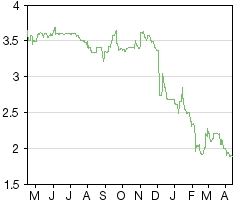 Following a large decline over the last few months, the current share price is now closer to our bear case, which skews risks to the upside in our view. We believe that continued ramp-up in the order book and clarity on the financial structure would represent the most important positive catalysts for the share price. Key risks to our forecasts and valuations include delays in ramping up commercial development, including risks associated with the requirement to organise public tenders for municipal clients; higher/lower competition and its impact on profit margins; and the potential impact of Brexit and friction on global trade (most of the addressable market is in the UK and North America). Source: Orège data, Edison Investment Research. Note: *FY17 results have been restated by the company and will be updated once the full accounts are made available. This report has been commissioned by Orège and prepared and issued by Edison, in consideration of a fee payable by Orège. Edison Investment Research standard fees are £49,500 pa for the production and broad dissemination of a detailed note (Outlook) following by regular (typically quarterly) update notes. Fees are paid upfront in cash without recourse. Edison may seek additional fees for the provision of roadshows and related IR services for the client but does not get remunerated for any investment banking services. We never take payment in stock, options or warrants for any of our services.